A care team focused on maximizing the quality of life for you and your family through comprehensive rehabilitation and education with a commitment to get patients back to their communities. If injury or illness compromise the quality of life for you or a loved one, the Acute Rehabilitation Center at Methodist Hospital can help. Our program is individually-customized to create the best treatment for you and your family. Inpatient rehabilitative services are available inside Methodist Hospital at the Methodist Acute Rehabilitation Center. This inpatient 22-bed acute rehabilitation facility offers a comprehensive rehabilitation program with hospital services such as 24-hour nursing and physician availability with an intensive rehabilitation therapy program. 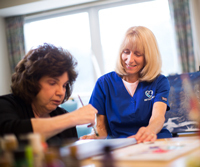 You, your family or caregiver and our specialists form a team with the ultimate goal of letting you continue to enjoy the best quality of life possible. We believe that you and your family should be an integral part of determining what is meaningful and important for you to achieve. Together, we will meet and establish goals for your recovery. We are fully accredited by The Joint Commission and the Commission on Accreditation for Rehabilitation Facilities (CARF). Achieving accreditation by these national and international standards organizations shows our commitment to quality, best practices and improving the service we provide to you. CARF has also identified Methodist Acute Rehabilitation as a Stroke Specialty Program that focuses on the unique needs of stroke survivors and provides effective rehabilitation. Our Acute Rehabilitation Center has received a Top performer award for excellent patient ratings of overall quality of care from Professional Research Consultants. See our patient satisfaction and outcome results.